This week has gone by really slow for some reason. I think it is because I have been worried about Marc. I know I shouldn't be but its the pre-mother instinct I have haha and Sister Heagy has had a really rough week. I am drained and now I am freaking out about transfers since I will know on Saturday where I am going and if I will be training and who I will be with for the next 6 weeks... its terrifying! I am trying so hard not to stress about it but man it sure is rough. 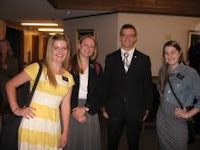 I am enjoying my mission very much and I love reading about everyone's! It sure is crazy to see how every mission is different. Well anyways I will fill you in on my week. Oct 21- It was a good P-day we just hung out with our zone and we played a game of basketball with some elders and then just talked. After we did our normal shopping at target for the coming week. We then went to an appointment with a LA that we were excited about and we had a member coming too. We pull up and she is outside and she thought we said 6 and told us an excuse about not being able to meet with us it was strange but she was really nice and we set up another appointment. Later the member we went with called us and told us that she sent an email saying she was offended that we asked her if she wanted to take the lessons which we didn't but that's alright she just isn't ready right now to come back to church and I came to the conclusion that it wasn't anything sister Heagy or I did. We were super bummed to hear that though. After we went to dinner with one of our favorite families the Andrus Family which was fun and just what we both needed! Oct 22- We had a great district meeting. I am so blessed to have an awesome district. We then went out to Taco Bell for district lunch which was fun. After Sister Heagy got permission to talk to her mom over email about her condition so I was on Mormon.org for awhile which was fun cause it felt like I was on FB for a minute cause some of my missionary friends profiles came up. After we had dinner with Sister Miles and her comp cause they were down for a Dr appointment. We ate pizza and talked with her which was just what Sister Heagy needed cause Sister Miles has gone through some things that Sister Heagy is experiencing so that was nice and helped her out a lot. Oct 23- This morning we went and painted Tina's house again with the elders which is always so much fun! We were there all day and then left to get ready for dinner. We then had an appointment with the Heath family in our ward that night which was fun. She is a single mom and has had a rough time in her past but she is super sweet and so are her kids. We shared the 30 day challenge with them and they were excited to do it. Oct 24- This morning Sister Heagy had a DRs appointment to get on some medication for her anxiety. We are all happy she is willing to do this and stick it out and make a decision on if she wants to go home or not. After we had an appointment with Aneeka which was great we just listened to her vent and talked about the atonement with her. After we had dinner and then had another recent convert lesson with the Wilfred's we taught the POS and temple work and family history. After that we had an appointment with one of our members who is widowed and use to be a mission presidents wife who served in Chile about 12 yrs ago. The spirit was really strong during that message. It felt so good to have a busy night for once. Oct 25- We painted again and then went to Sister Heagys counseling appointment at the church and then went to dinner. She was having a rough day so we took it easy and that night we were able to help the RS pres with the Christmas gifts for the ward. We filled up little vile's with honey because it is going to be an ornament with a cute saying from the honey bee talk. Oct 26- We had our Halloween party this evening which was fun. This day was the hardest with Sister Heagy, cause I thought she was going to call her mom to pick her up. We went and talked with Sister Hobbs who gave her comfort and told her to not give up that easily but it still was a rough day. Oct 27- We had our normal meetings at church today and Sister Heagy was doing a lot better today! She was happy and more like herself which made me happy! It was one of the youth's missionary farewell who is leaving to Honduras and so after dinner we were invited to come over for dessert so we were there for awhile talking with everyone in the ward. It brought back a lot of memories though I am so happy that is behind me and that I have already been out 4 1/2 months!! Well I have to go but I love you all and I know this church is true and I see the Lords hand in my life every single day! Have a great week! He has been called to Honduras! So excited for him.